This is a facial geared for the specific needs that men have. You’ll receive a deep cleansing, hot towels, exfoliation, customized mask and moisturizing along with a relaxing massage. This hits all the right notes and we promise not to tell the boys how much you enjoyed it! Facials for men are specifically formulated to male needs, which are often shaving-related, such as razor burn, or other conditions like skin sensitivity and dullness. There are also men’s facials that target skin roughened by spending time in the great outdoors and ones that are tailored to acne, excessive sweating, living in a city, and skin conditions related to aging. Deep-pore cleansing, moisturizing, exfoliation, toning, and vigorous facial, neck, and shoulder massages are sometimes included during men’s facials, which usually last 60-minutes. Different products are used for men’s and women’s facials, and when essential oils are used, more traditionally masculine scents are the norm and masks, lotions, and hot towels are often utilized. 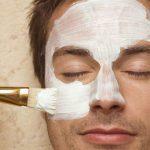 Men may need to schedule a series of facial treatments to see optimal results. This is such a soothing, relaxing and much-needed treatment for the hard-to-reach area of the back. You’ll get a cleansing, hot towels, exfoliation, deep pore cleanse, custom back mask and a soothing back massage. It’s kinda’ like getting your oil changed, but better. You’ll be good for another 3000 miles!